To preserve the record of the memorial project, a number of 'inactive' web pages have been brought together on this archive page. Included are; a photographic record of the construction; a diary of major events in the life of the memorial; the design, materials and symbolism of the memorial; the background to the memorial and the reason for building it. On Thursday, July 4th, 2013, in the presence of Her Majesty's Lord Lieutenant of Staffordshire, Mr Ian Dudson CBE and 200 guests including 25 WW2 veterans and 6 Standard Bearers, the Combined Operations Command Memorial was unveiled by General Sir Richard Barrons KCB CBE ADC Gen, Commander of the Joint Forces Command and dedicated by the Reverend Prebendary Tony Wood. No greater honour could be bestowed on the service personnel of yesteryear, than for the Commander of their modern equivalent Force to honour their memory and achievements in this way. 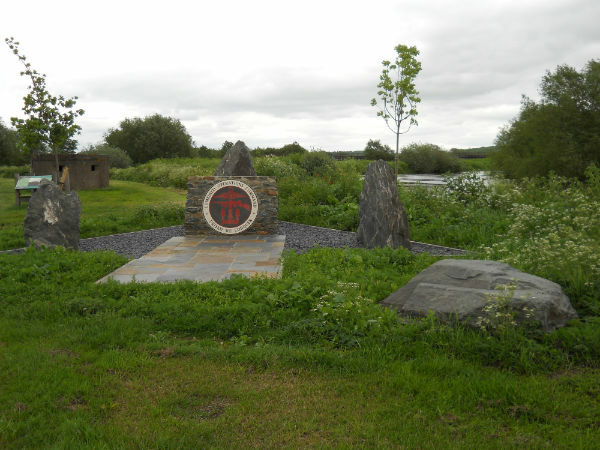 The memorial is on the north bank of the River Tame in the grounds of the National Memorial Arboretum at Alrewas in Staffordshire, England. Entrance to the Arboretum is free and visitors are very welcome. Electric scooters and golf style buggies are available for the less ambulant. In photos and text, this page tells the story of the memorial's development from its tentative beginning in the mid "noughties" to the dedication ceremony in 2013. 1 Memorial site looking east along the River Tame. A tranquil setting on a nice day. 2 Site looking west. The Arboretum's road network is moving into the area. 3 Clachan Quarry, Loch Fyne, Scotland. Hand picking rocks for the wall mosaic wall. 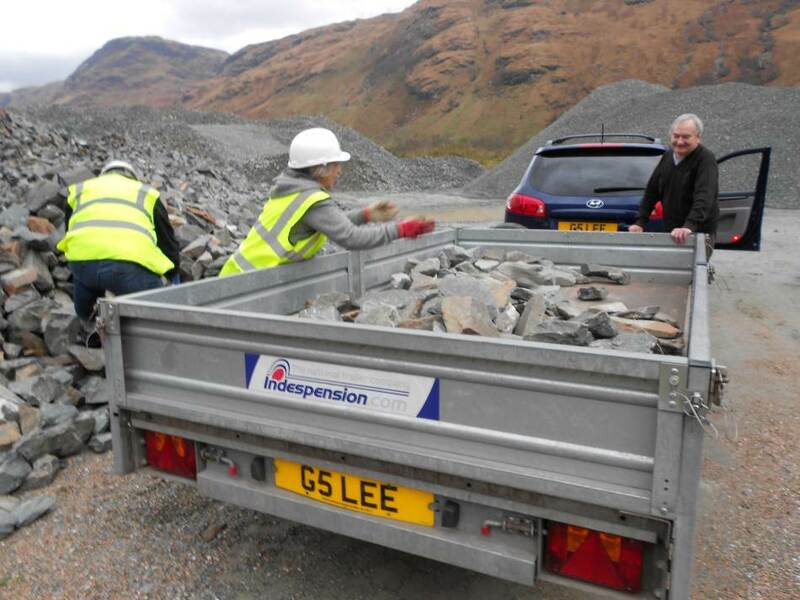 4 1.5t of rocks were generously donated by David Bonnar of the Clachan Quarry. 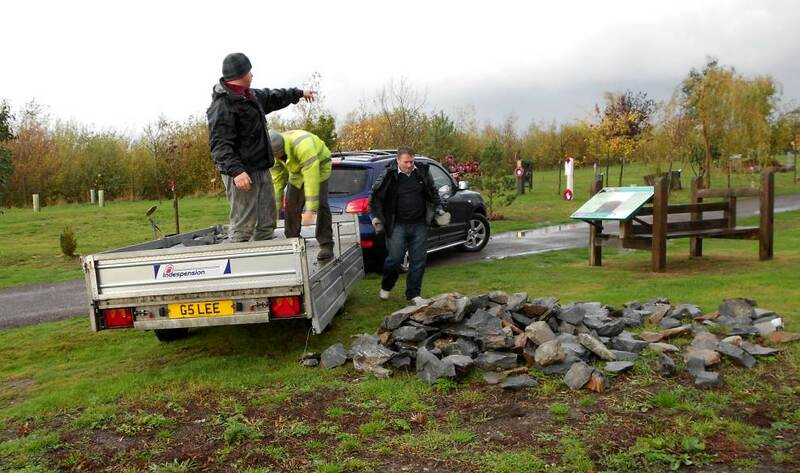 5 Unloading the stones at the memorial site after a journey south of 400 miles. 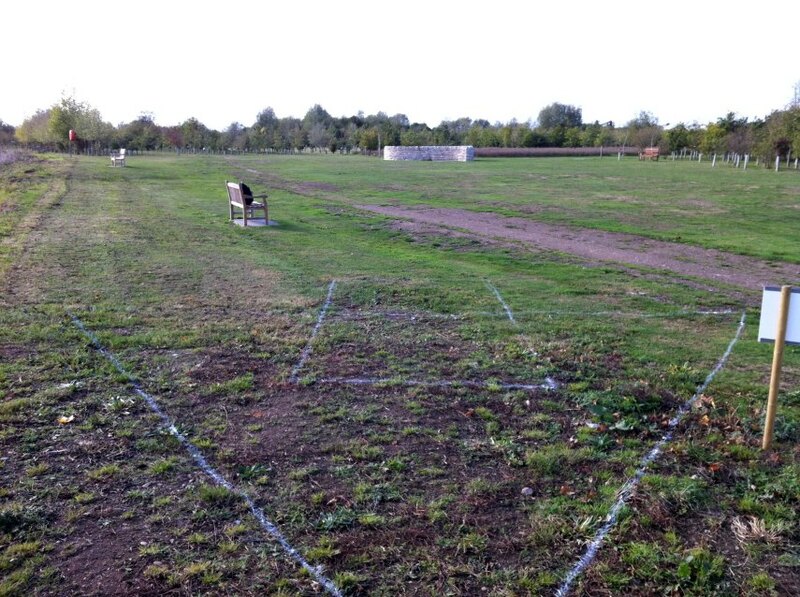 6 Site is now ready for work to begin. 7 Site is cordoned off as digging foundation holes begins. 8 Holes for standing stones dug. 9 Dedication stone at the spearhead tip placed in position. 10 2nd stone is lowered into the ground. 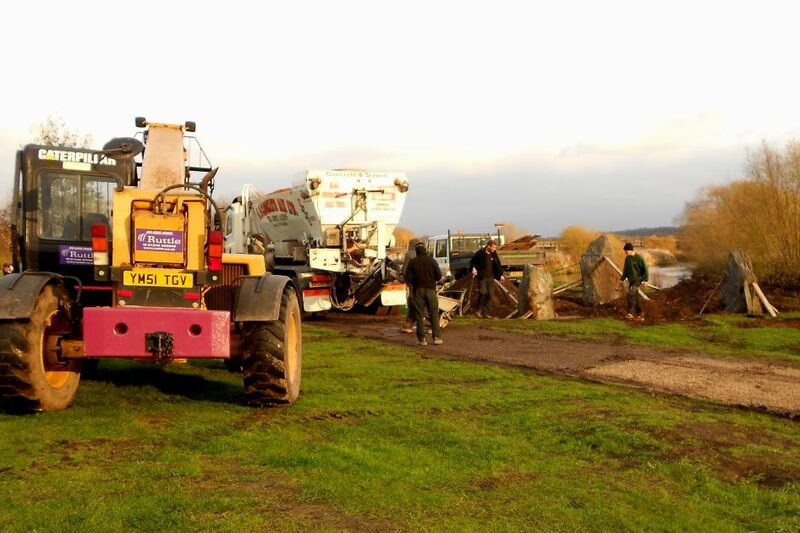 11 Securing the 3 standing stones in quick setting concrete. 12 Stone resting place with paving slabs for spearhead shaft in foreground. 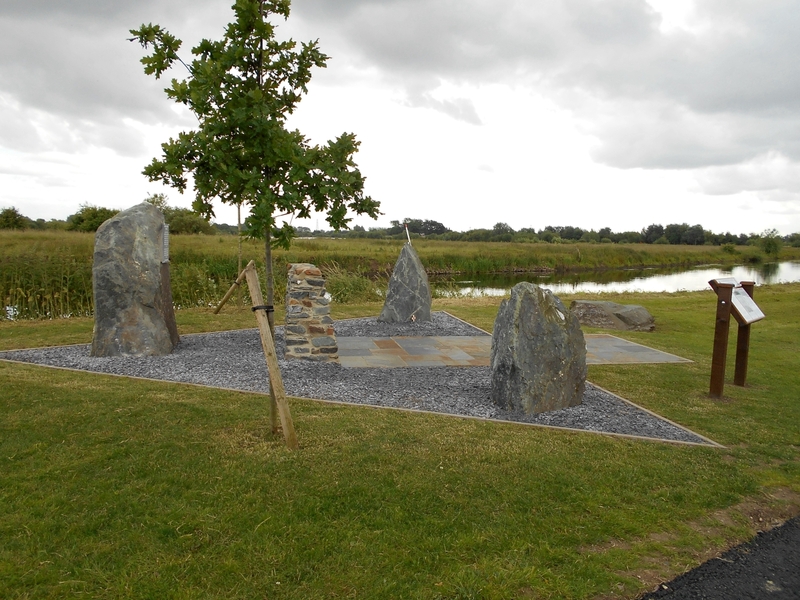 13 Memorial from spearhead shaft with dedication stone in centre. 14 The edging strips are embedded in concrete. 15 Excavated soil is recycled to landscape the surrounding area. 16 The spearhead shape becomes clear..... 17 ...paving stones laid and mosaic wall partially built. 18 The Navy's Oak and the Army's Ash are planted. 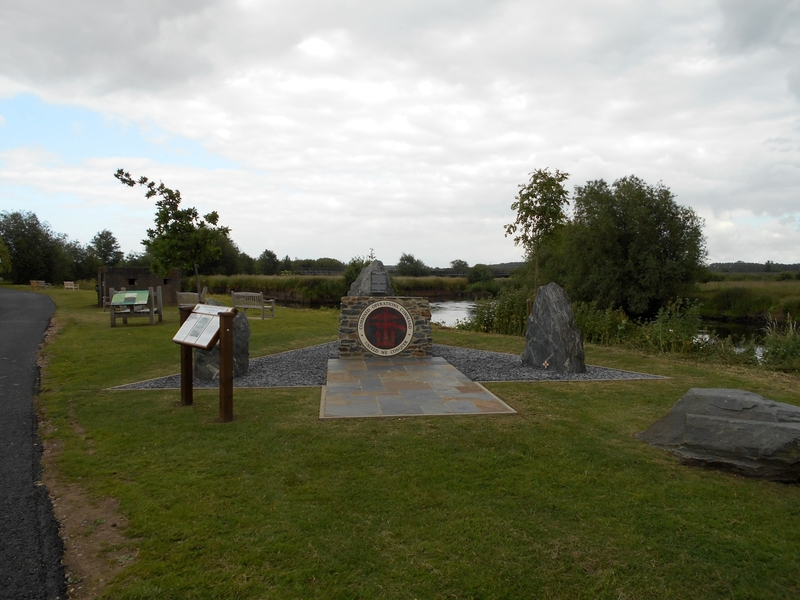 25 ...but thanks to Richard Stimpson, the memorial site is restored. 26 This view is looking towards the Arboretum entrance. 27 Mid November 2012. Courtesy of Peter Scally. 28... Spring 2013. Only a few months to the dedication ceremony. 29 The dedication plaque is secured to the apex stone which completes the memorial. 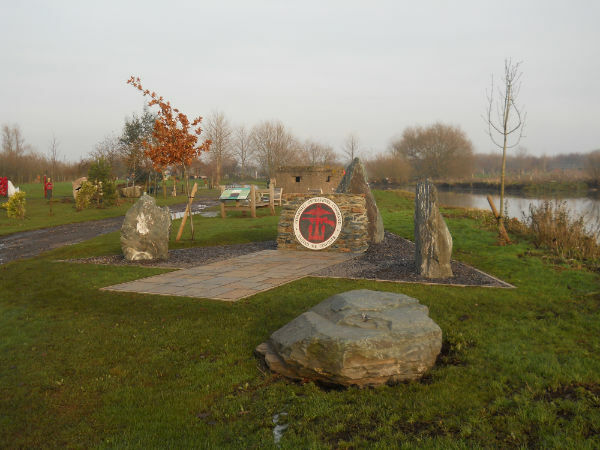 30 The grass cut and the site tidied up in readiness for the dedication ceremony. 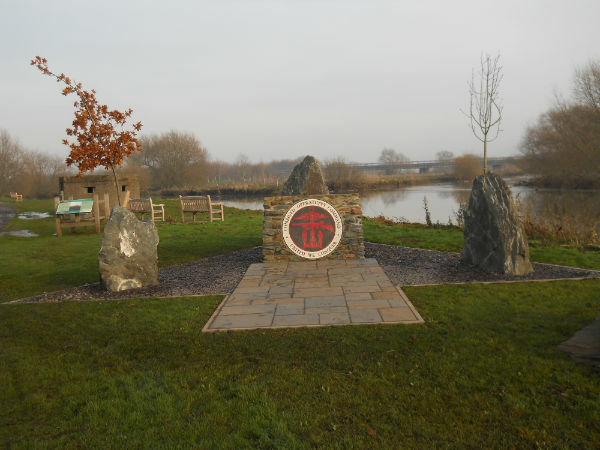 06/01/09 - First application to erect a memorial to Combined Operations in the grounds of the National Memorial Arboretum (NMA) in Staffordshire submitted to their trustees for consideration. 28/04/09 - Plans approved by the NMA trustees. 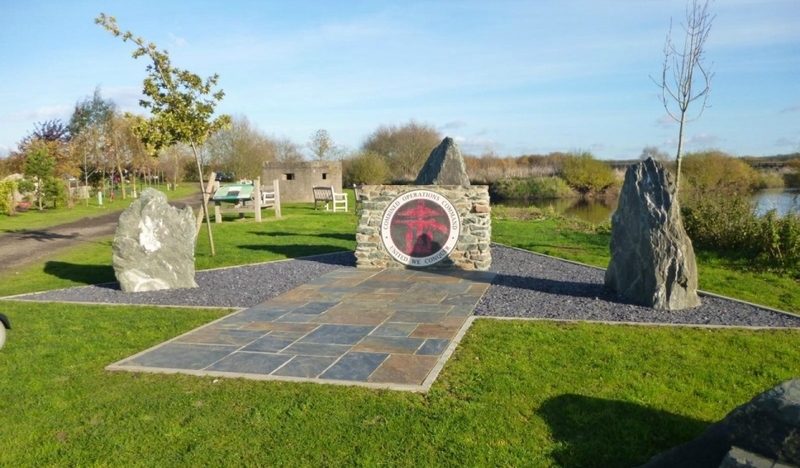 19/08/09 - Four Large Stones weighing around 15 tons uplifted from the Clachan Quarry on Loch Fyne, Scotland and transported 375 miles to the National Memorial Arboretum. 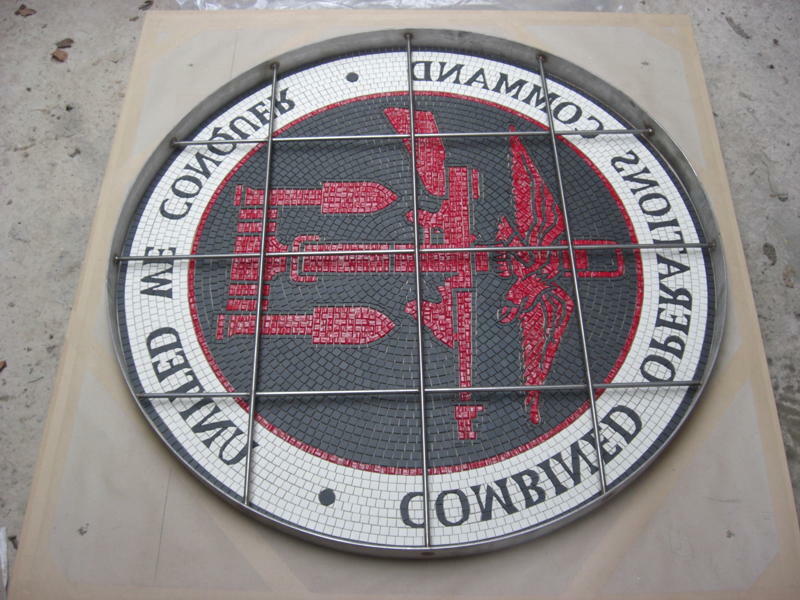 22/09/09 - Mosaic; work commissioned. 07/12/09 - Mosaic; design artwork approved. 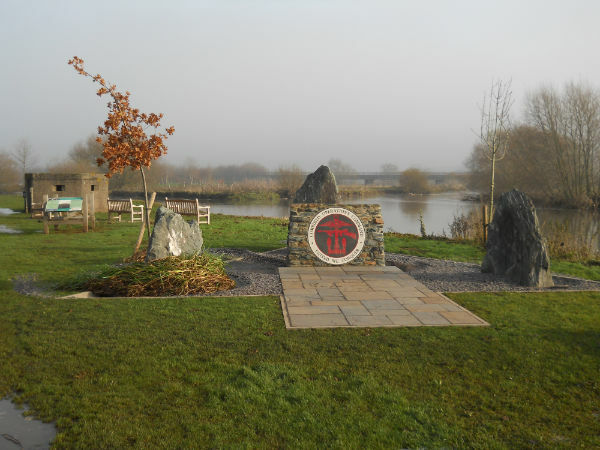 24/02/11 - Memorial Site; National Memorial Arboretum confirmed location of the Memorial. 28/02/11 - Seeking tenders for construction of the memorial. (Postponed. See note below). 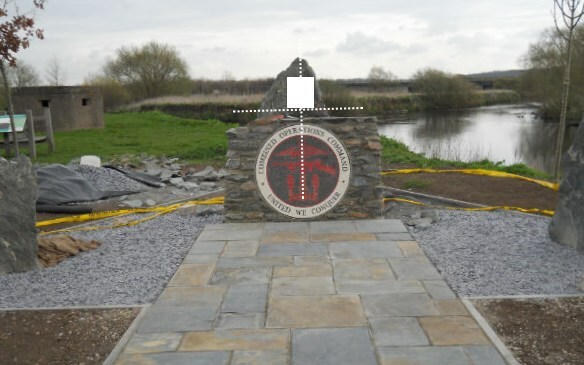 14/04/11 - Amended plan submitted to the NMA to 1) improve the display of the mosaic by moving it from a horizontal position to a vertical position, 2) reduce the cost of construction and 3) reduce the need for long term future maintenance. Full details here. 14/08/11 - Amended Plan Approved. 05/09/11 - Seeking tenders for construction of the memorial. 14/10/11 - Contractor appointed. Work to start in November, weather permitting. 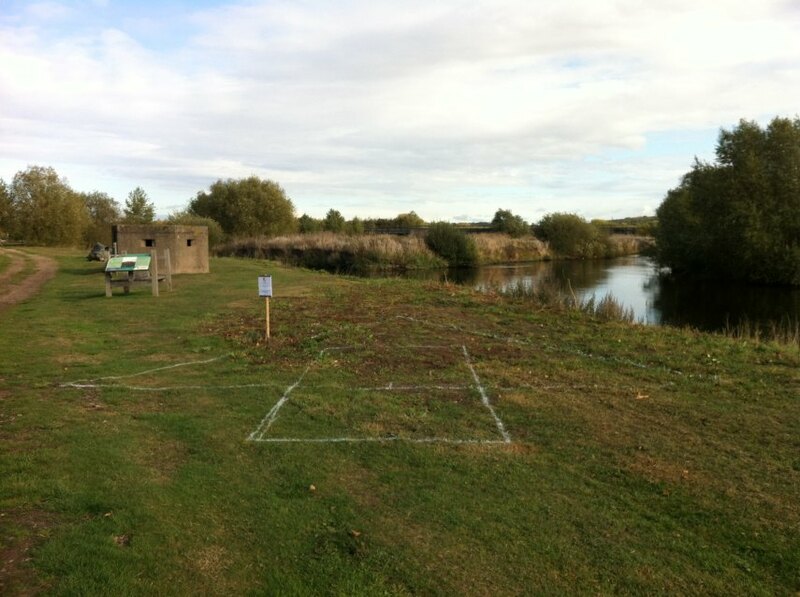 20/10/11 - Memorial Site Marked Out. 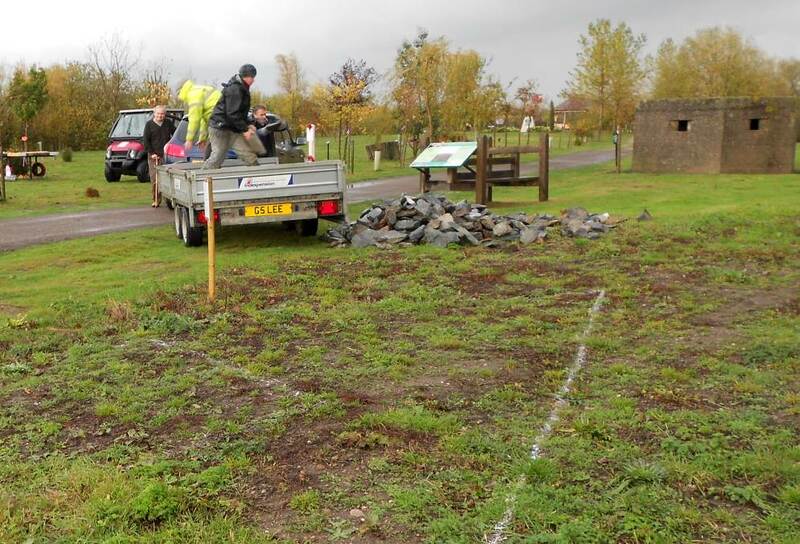 Position and orientation of memorial plot marked out and temporary information sign erected. 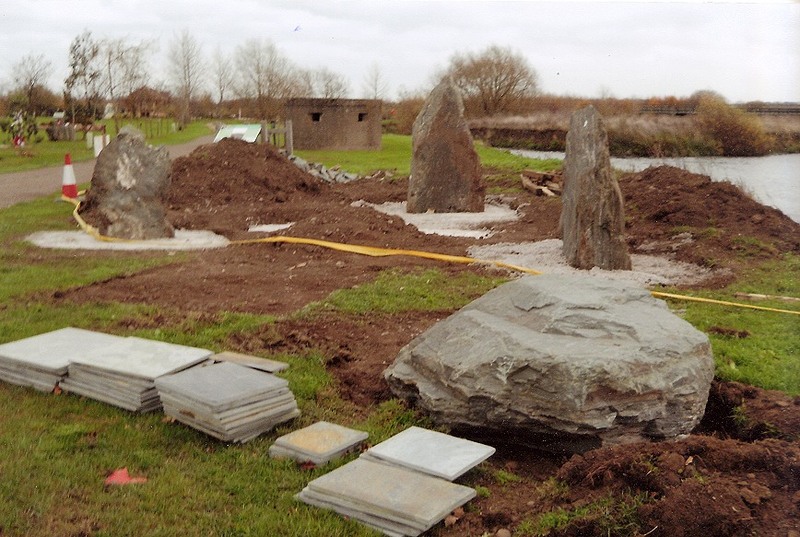 21/11/11 - The 3 standing stones were placed in pre-prepared holes and concreted in. Work was halted after two days, when the access roadway near the memorial site was deemed unfit for very heavy goods vehicles. Work will resume in the spring, when improved ground conditions permit access. 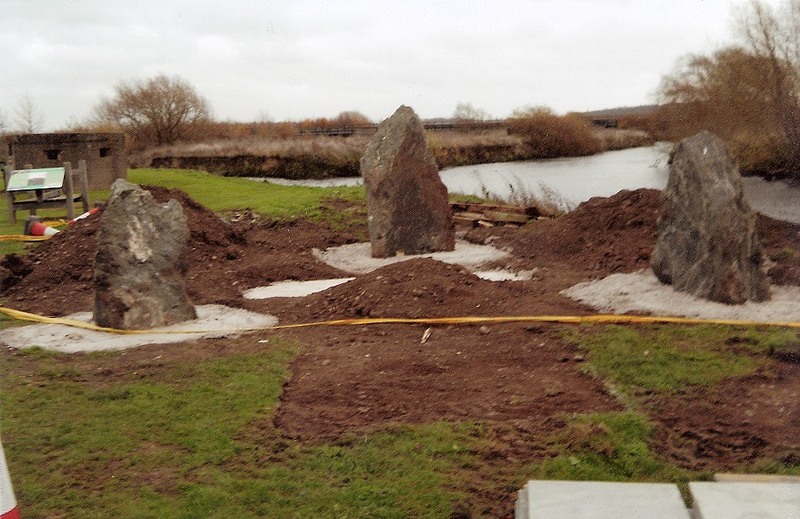 14/02/12 - The edging strips are concreted in place permitting us to clearly see the spearhead shape of the memorial for the first time. 14/03/12 - Paving stones laid down and spearhead shape filled in with base material. Oak and ash trees in place. 02/04/12 - Mosaic wall nearing completion. 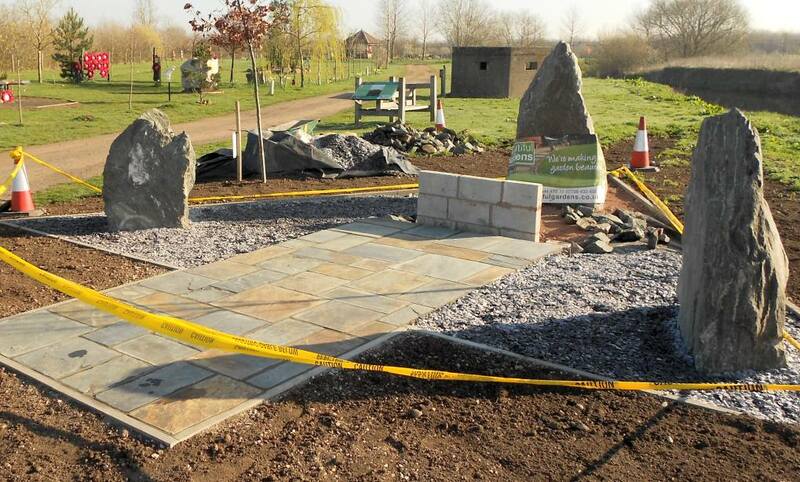 15/04/12 - Memorial almost completed. 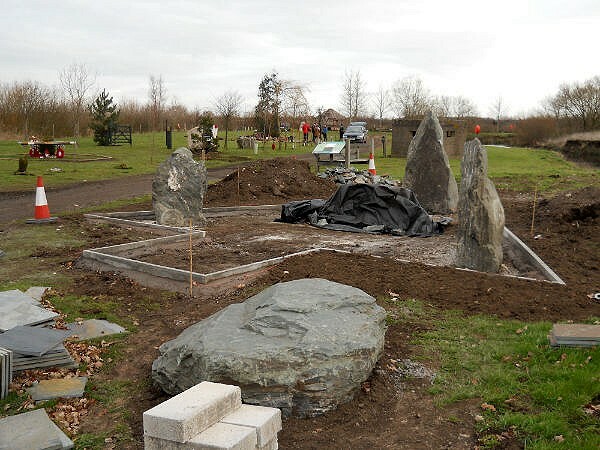 Disturbed soil surrounding the memorial to be seeded, Sitka Spruce tree to be sourced and planted and the positions of the plaques to be recessed. 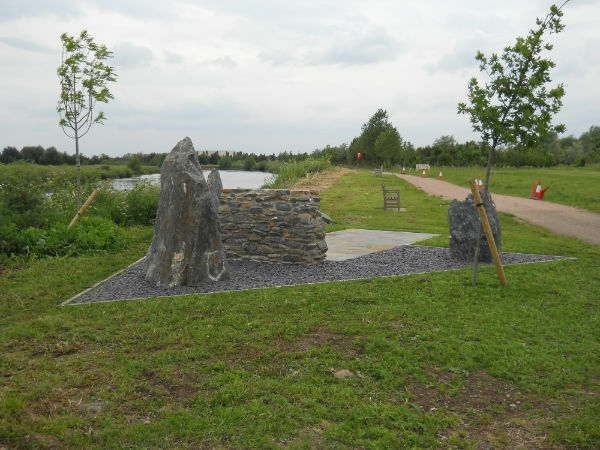 Minor addition to the standing stone behind the mosaic wall to provide the recessed shape on the centre-line of the memorial. 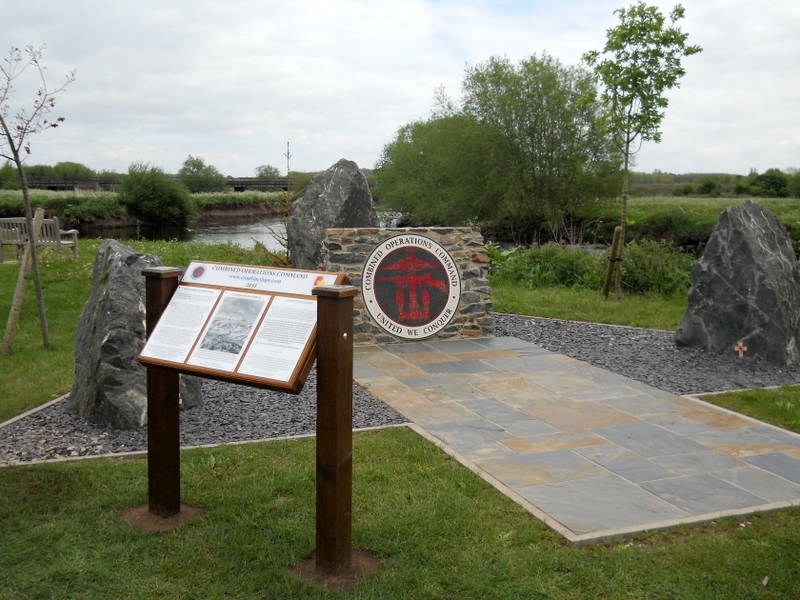 16/09/12 - Display board and plaques approved by the NMA's Memorials Advisory Committee. Three quotations sought for the manufacture of the plaques. 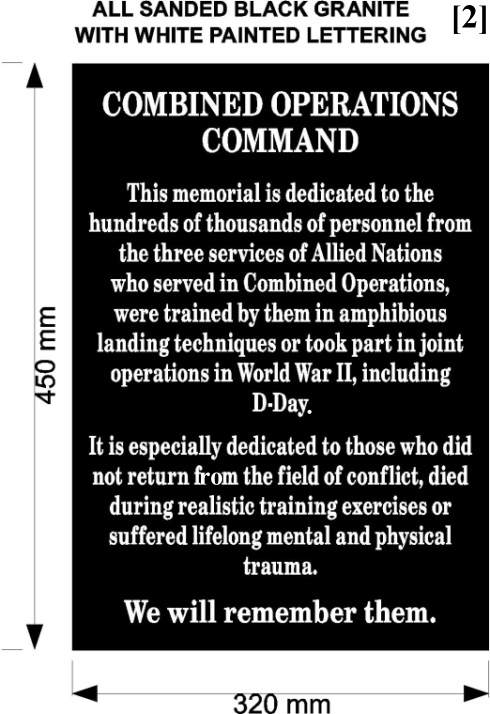 14/10/12 - Dedication and Information Display plaques ordered. 22/11/12 - Information Plaques delivered. Next step is the manufacture of the free-standing display stand. 13/12/12 - Air Chief Marshall Sir Stuart Peach, KCB, CBE, Commander of the Joint Forces Command, will unveil the dedication plaque at a ceremony to be held on Thursday July 4th 2013. 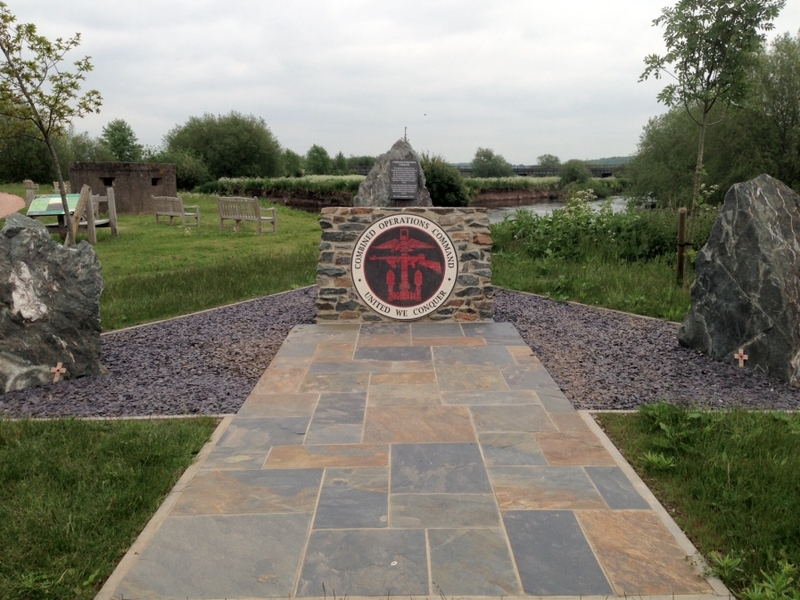 20/04/13 - General Richard Barrons, CBE, Commander of the Joint Forces Command will unveil the dedication plaque. 20/04/13 - The information display is erected courtesy of Richard Stimpson. 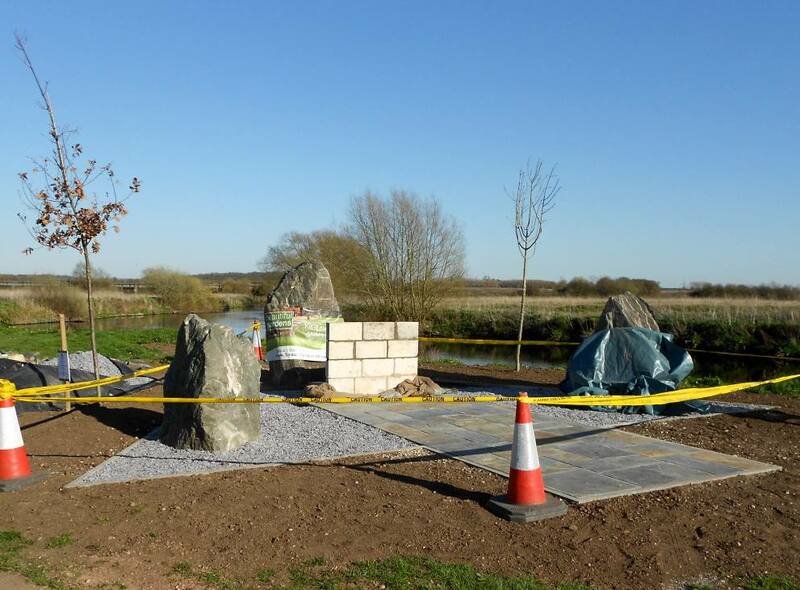 05/06/13 - The Dedication plaque is secured to the apex stone. 04/07/13 - The Dedication Ceremony! There is a high level of symbolism in the design and content of the memorial. 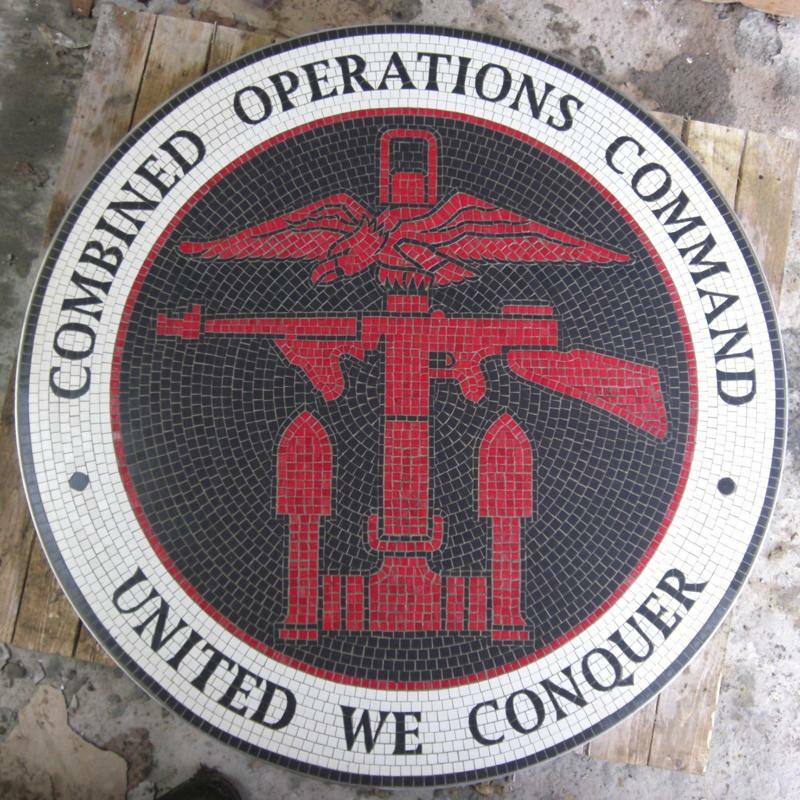 Combined Operations drew on the personnel, resources and best practices of Land, Sea and Air forces and in the design, the Army, Navy and Air Force are represented by the 3 trees and 3 stones. The spear-head shape is indicative of the archetypal attack formation adopted during raids and landings - the tip representing the initial assault troops, the main part of the spearhead representing the support troops and reinforcements and the shaft, reserves. 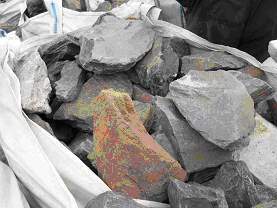 The stones came from Loch Fyne, in Scotland, where hundreds of thousands of service personnel trained in amphibious landing techniques under the auspices of Combined Operations. Some Commandos were also trained in the rugged terrain of this area. Who, amongst them, ever forgot Inveraray! 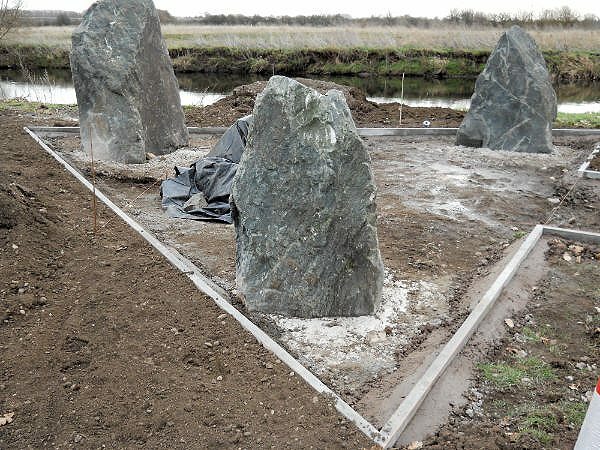 The Four Large Stones, around 2.0m to 2.7m in length, were generously donated by David and Danny Bonnar of Clachan Quarries, Loch Fyne, Scotland. 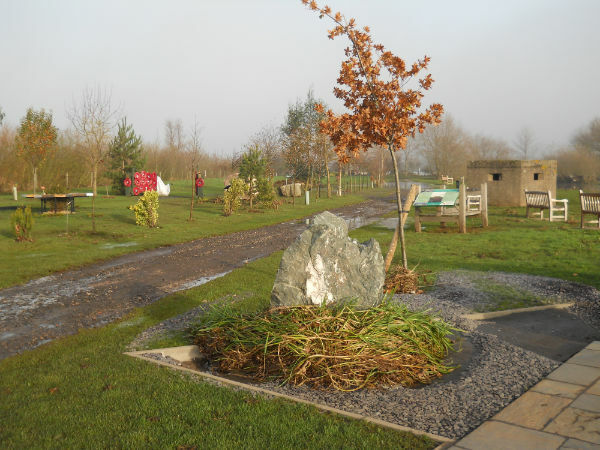 Three tree varieties were chosen for their symbolic association with the three services... oak for the Navy, ash for Army and Sitka Spruce for the RAF. Oak was used in the construction of the early wooden battle ships, including HMS Victory, ash was used in the construction of wheels and limbers for the artillery, frames and wheels for field transport (RAMC and RASC lorries), pick-axe handles and the rings for rope ladders, while the Sitka spruce was used in the construction of early 'stick and string' planes right through to the modern era. We are indebted to the RN Naval Historical Branch, the RAF Historical Society and Richard Stimpson for their advice in the selection of the trees. 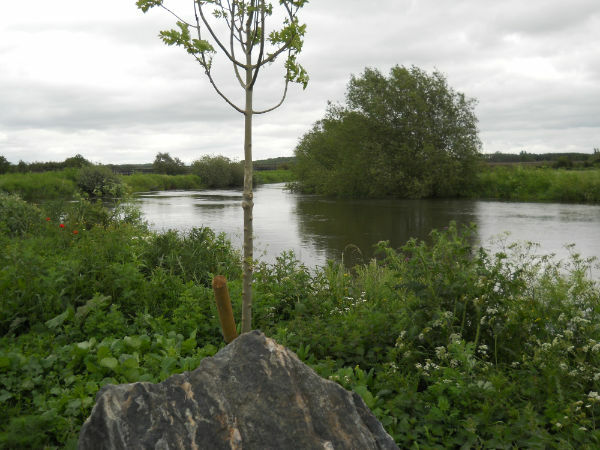 The Sitka Spruce will be positioned a few metres behind the dedication stone, the oak will be positioned forward and to the right of the spearhead shape appropriately close to the river and the ash in a similar position to the left of the spearhead shape. The dedication plaque is made of black, unpolished granite with white lettering. It will be recessed into the standing stone at the apex of the spearhead shape. 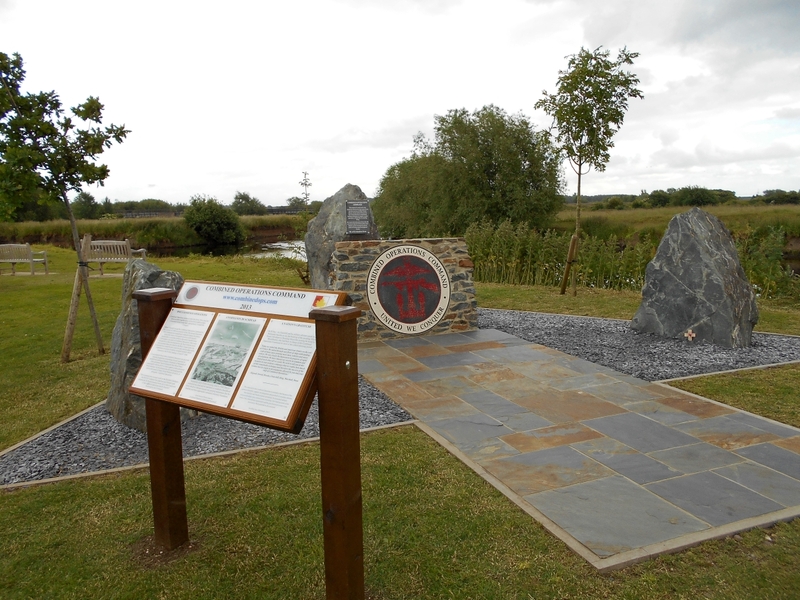 The colourful, acrylic information display is attached to a hardwood base and will be positioned in front of the memorial to the left of the spearhead shaft on a wooden stand. To view the plaques click on the links below. 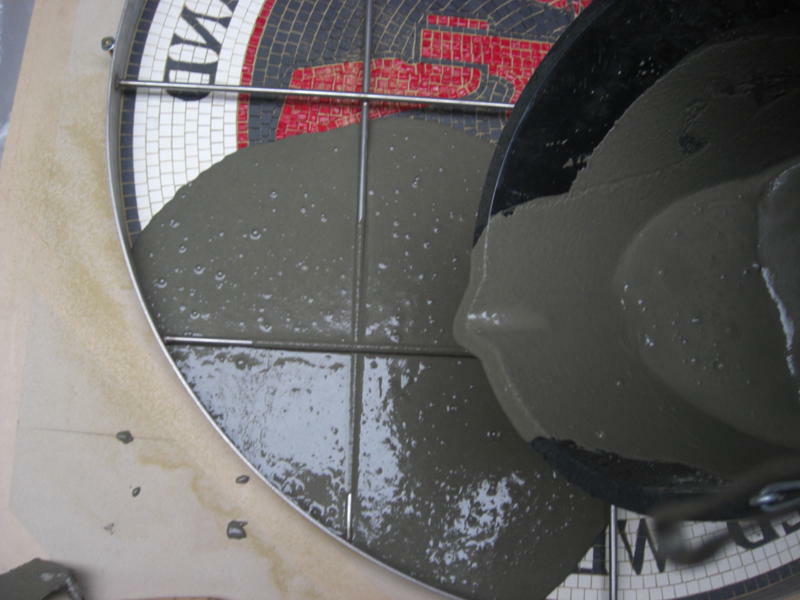 The mosaic is contained within a 50 mm deep stainless steel band, 1m in diameter. In the design, the eagle represents the RAF, the Thompson machine gun represents the Army and the anchor represents the Navy. The red parts in the design are made of vitreous glass mosaic tiles and the remainder aquatic ceramic tiles. This combination provides the best contrast between the black and red colours. 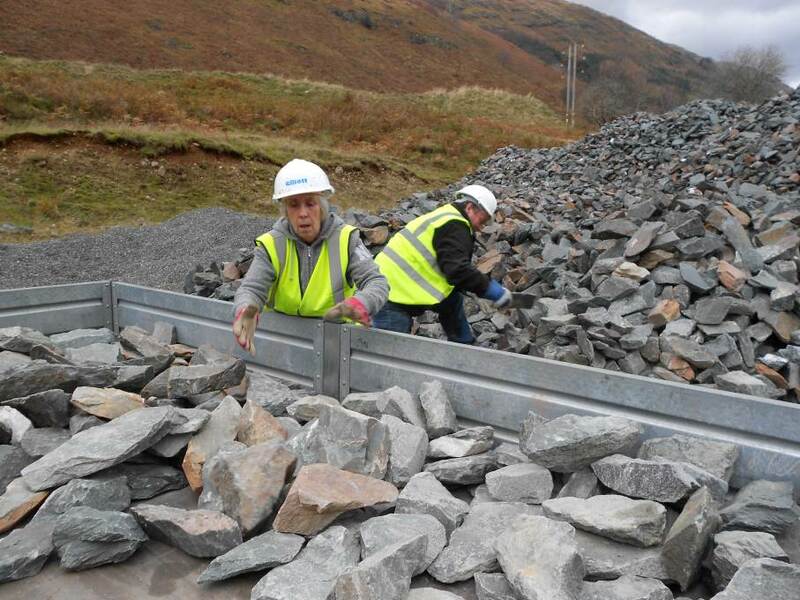 The wall is faced with stones from the same quarry as the larger stones, thus reinforcing the historical association with the No 1 Combined Training Centre at Inveraray on Loch Fyne. 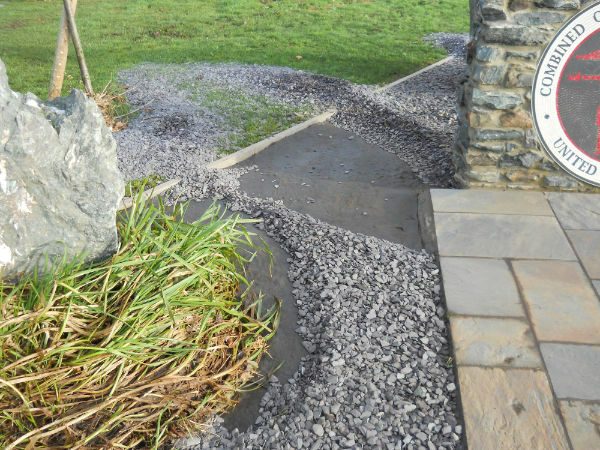 The paved stone was chosen to match the carboniferous limestone from Loch Fyne. It will allow easy access for pedestrians, wheelchairs and buggies. The outer edge of the spearhead shape comprises 28m of edging stone. 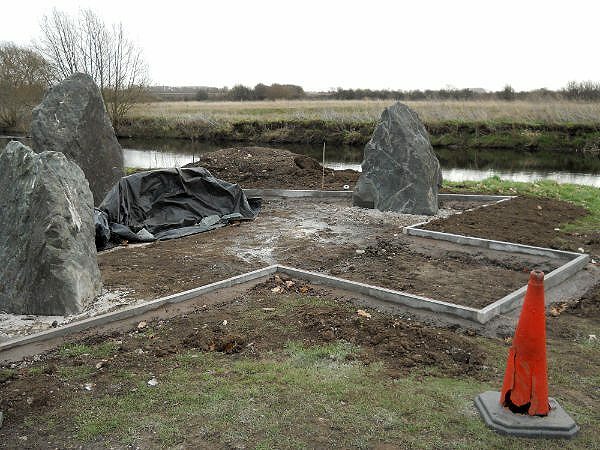 The area within the triangle, not covered by the slabs or occupied by the mosaic wall and the standing stones, has been filled in with crushed slate similar in appearance to the standing stones to provide a flat and level surface. Towards the end of the 1990s, my late father in law, John Glen, first talked about his wartime service in the Combined Operations Command. By then the Command had all but faded from the collective mind of the people, save for the few who had served in it or had a special interest in military history. On leaving school, John had gained qualifications in radio repairs. With the advent of war, this caught the attention of the RAF, who were secretly developing a new technology based on radio waves. This became known as radar - radio detection and ranging. The RAF trained John as a radar technician and he saw service at various land based coastal radar stations in Scotland and the north west of England. The work was top secret, as was the conversion of three LSTs (Landing Ships Tanks). The LSTs would provide extended radar cover, early warning, friend or foe identification, communications and intelligence gathering off the Normandy beaches. They would hand over to mobile land based radar units when they could safely operate on French soil. By then, a flight sergeant, he was attached to the Combined Operations Command and reported to John Brown's shipyard on the Clyde, where the three LSTs were being refitted for their special tasks and designated 'Fighter Direction Tenders' (FDTs). As his story of D-Day and its aftermath unfolded, I read Bernard Fergusson's excellent book "The Watery Maze" about the Combined Operations Command. There was not a single reference to the Combined Operations and its Command on the Internet, so, with no serious intent or purpose, I constructed a small website and published a few pages in 2001, just months after John's death. Remarkably, veterans, their families and friends found the website and offered material, photos, support and encouragement. The website grew like topsy and I was surprised to learn there was no memorial to the Command. With a mild sense of outrage, little preparation, no design, no place on which to build, no committee, no bank account and no money, I launched the Combined Operations Memorial Fund. There was so much goodwill and support, it would have been difficult for the project to fail. Problems and obstacles were overcome and those who attended the dedication ceremony all had a personal reason to be there. The presence of so many veterans and tear filled eyes amongst the onlookers was humbling. It was a happy and emotional day. 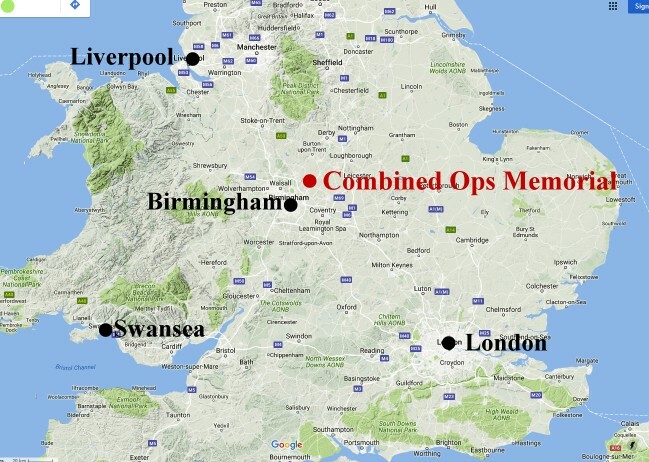 Combined Operations was set up by Churchill post Dunkirk to think, plan and train for offensive operations. They were the only ones doing this at a time when the "regular" armed forces were rightly concerned with the defence of the country. The resultant planning and preparations for battle were organised under the contiguous commands of Keyes and Mountbatten. The many major battles and campaigns of WW2 are well documented and amply represented in museums at home and abroad and in books and films but few realise that without Combined Operations the results might have been very different. Combined Operations trained hundreds of thousands of men in amphibious landing techniques, set up the Commando Units, oversaw the Mulberry Harbour project, PLUTO (Pipeline Under the Ocean), Hobart's Funnies (innovative adaptations to tanks for beach clearing), seaborne radar and communications (Fighter Direction Tenders) and even experiments in the design of ships made of ice, not to mention the design, procurement and subsequent modification of around 40 different types of landing craft. 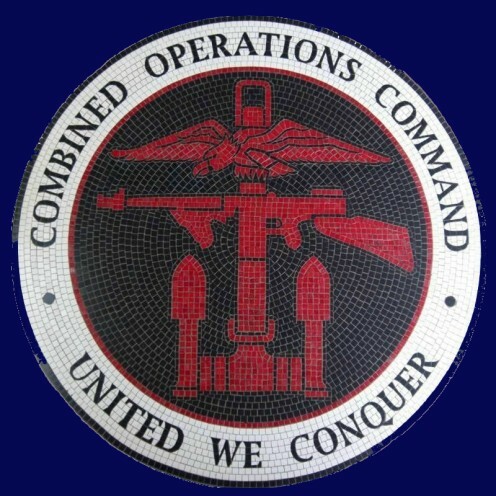 The strength of Combined Operations had its origins in the three services working closely together under a single command. 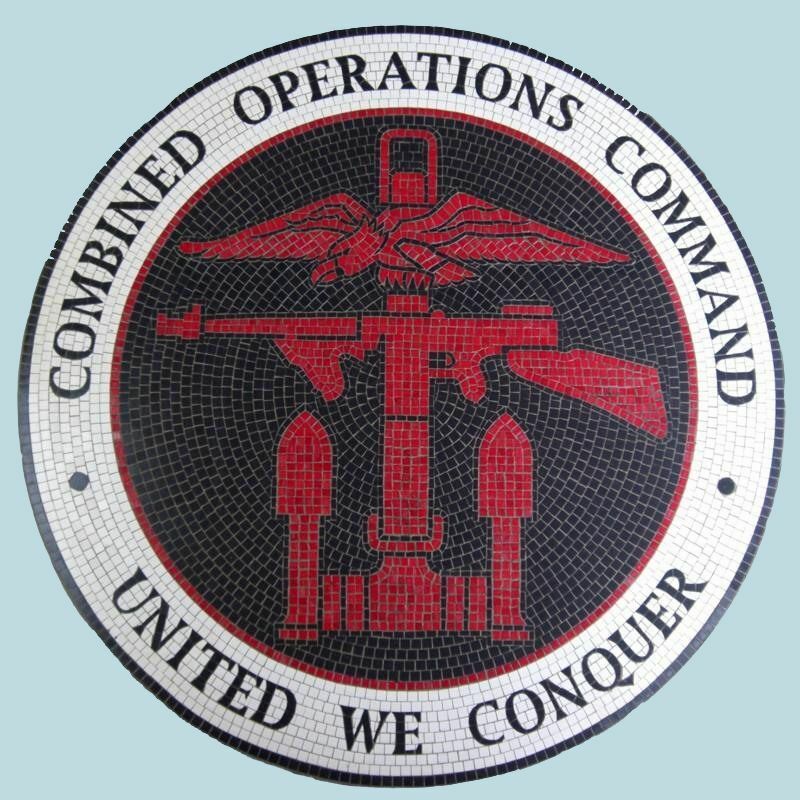 Their aptly chosen motto "United We Conquer" needs no explanation. encourage young people to use the website for educational and/or family research purposes. 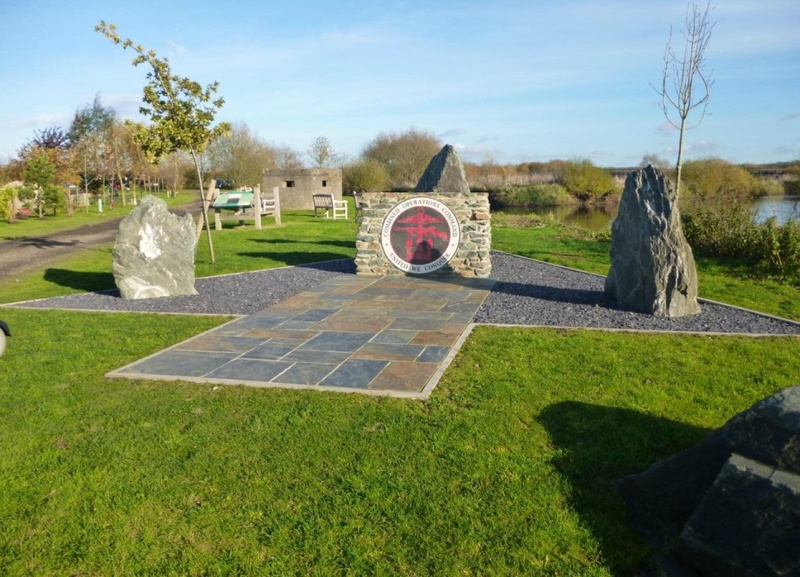 The memorial will be prominently featured on the Combined Ops website so those unable to visit the physical memorial will find a focus for reflection and remembrance and the website URL will be displayed on the memorial. Those who served the Allied cause in Combined Operations deserve to be recognised and remembered. After all they trained together, they served together and they died together. It is time to remember them.. together . The original time for the start of the dedication ceremony has been brought forward by 30 minutes to accommodate changes. Revised timetable below. Recommended arrival time 11.30 am to 12.20 pm. Veterans, please wear your medals with pride! The formal invitation list is now closed. Thank you for your interest. General Sir Richard Barrons KCB CBE ADC Gen, Commander of the Joint Forces Command, will unveil the dedication plaque at the ceremony. It's very fitting for the service personnel of yesteryear, who served in or alongside the Combined Operations Command, to be honoured by the presence of the Commander of their modern equivalent force. The Lord Lieutenant of Staffordshire, Mr Ian Dudson, CBE, accompanied by his wife, will also take part in the ceremony. A National Memorial Arboretum leaflet, which includes information about travelling, accompanied the invitations. 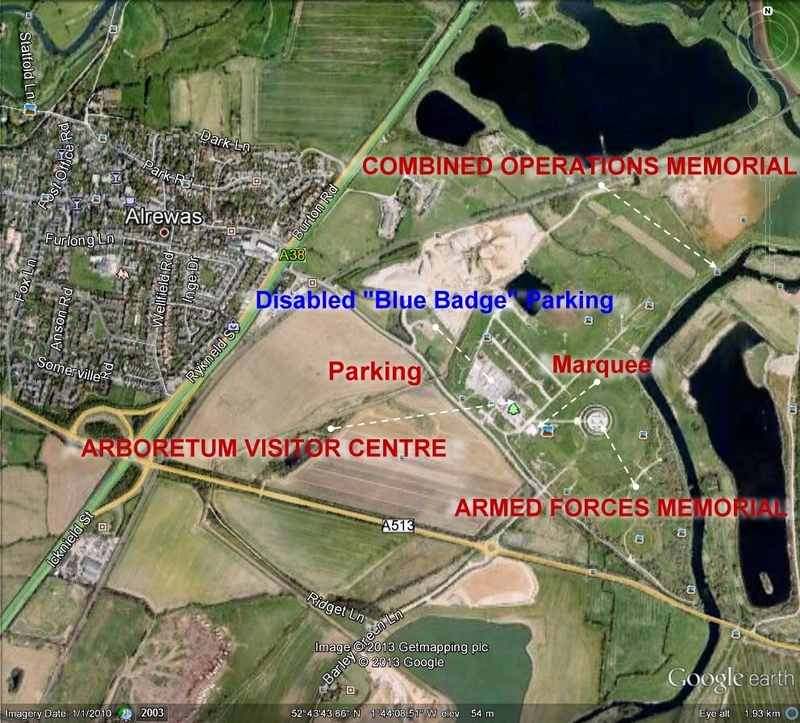 For the majority, arrival at the Arboretum between 11.30 am and 12.20 should allow time to park, receive information from the Memorial Reception Desk in the visitor centre and proceed to the marquee for refreshments - a total distance of around 300 yards from the disabled parking area. The Memorial Reception desk will be manned from 11.30 am to 1.00 pm. 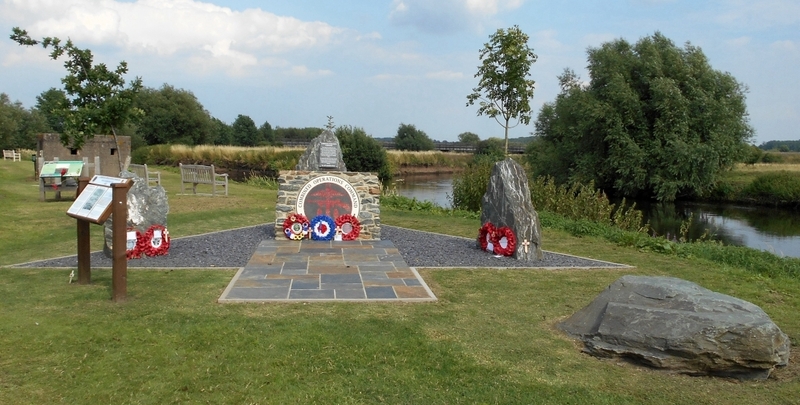 Late arrivals may wish to go directly to the memorial site for the start of the ceremony at 1.30 pm. 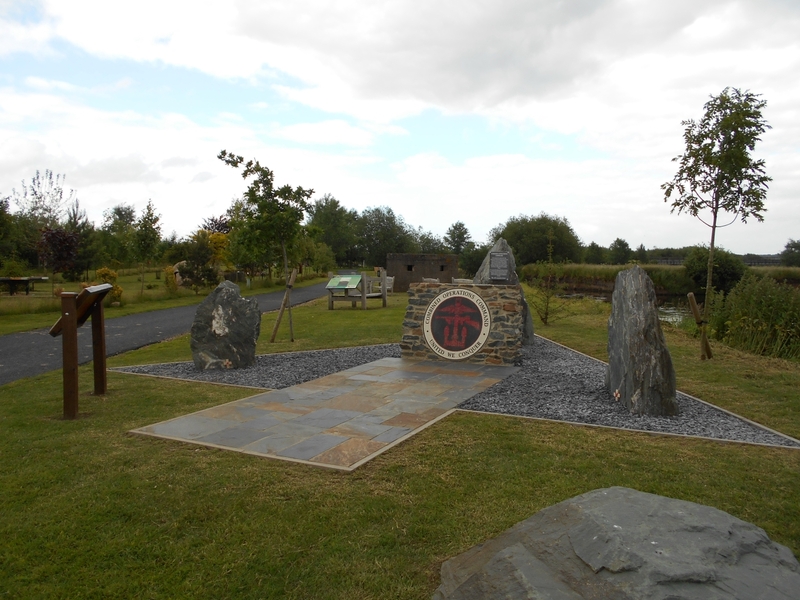 The memorial is a good 15 minute walk from the visitor centre. On the day, two large "golf style" buggies with 5 passenger seats will be available to transport anyone needing assistance over this distance. Please let me know if you would like to use this service. If there is a heavy demand we'll need to start the shuttle service earlier than 1 pm. If you require the use of a motorised scooter or wheelchair from the Arboretum, please make arrangements with them in advance - info@thenma.org.uk or 01283 792 333. Scooters - £5.00, wheelchairs free. Supplies are not unlimited so please book early to avoid disappointment. Pre-ordered poppy wreaths are available from the Arboretum for uplift on the day of the ceremony at a cost of £18.00. For a further £2.00, an insert with a message and/or image will be added. Your text and/or image should be sent to the Arboretum by e-mail attachment (PDF). Please order well in advance to avoid disappointment. Contact info@thenma.org.uk or 01283 792 333. For Sat Nav purposes the post code of the Arboretum is DE13 7AR. As further detail is added to the ceremony the schedule below may be subject to minor changes. 11.30 - 1.00. Arrive, check in at the Combined Operations reception in the visitor centre and assemble in the marquee where name badges will be issued and tea, coffee and biscuits will be served from 12 noon to 1.00 pm. 1.00 – 1.30. Make way to the memorial site. 1.30 – 2.15. The ceremony will start with the arrival of the Official Party and Standards. 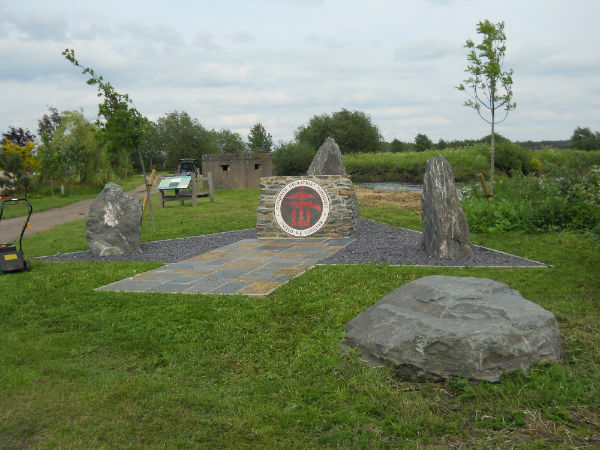 i) Welcome and introductions, brief history of the memorial project and symbolism in the memorial design and materials - Geoffrey Slee, Combined Operations Memorial Fund. 3) Remembrance and Learning for Future Generations - Lord Lieutenant for Staffordshire, Mr Ian Dudson CBE. 4) Dedication service - The Reverend Prebendary Tony Wood. 5) Unveiling of the dedication plaque - General Barrons. 6) Dedication of the memorial - The Reverend Prebendary Tony Wood. 7) Laying of wreaths - Groups and individuals. 8) Last Post and Reveille - Bugler Adrian Harper. 2.15 – 3.00. Official and family photos/return to the marquee. 3.00 – 4.40. Reception - afternoon tea, displays, guest book, social mixing, announcements. 4.40 – 5.00. Dispersal. The Arboretum closes at 5.00. A leather bound guest book will be circulated during the reception, which everyone is very welcome to sign. Half of the book will be used to display photos and messages received by post or e-mail following the event. The book will become a permanent record of the day's events. Visit the memorial sub web for other information about the memorial.